We’re really not sure whether this should be listed as an herb, or whether it might be more appropriate to list it as a vegatblae, under “greens”. Anyway, here it is. If there are any, we haven’t seen them: the seeds are invariably called simply “salad burnet” (or, occasionally, just ”burnet”). Burnet is apparently not fussy about its soil, tolerating extremes of pH and even nutrient-poor conditions. It wants partial to full sun, but is said to tolerate a fair amount of shading—one source says 6 hours of sun will suffice. Direct-seed it fairly early in the season, preferably in a modest-sized container or pot. Chances are it will come up again by itself every year thereafter, whether by survival or by re-seeding (which it is said to do freely). 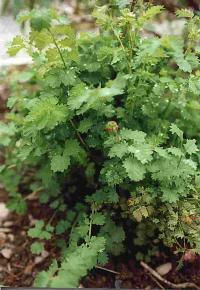 Burnet just wants moderate watering, but—like most herbs—doesn’t like “wet feet”, so arrange for good drainage. Better to under-water it than over-water it. Because it grows vigorously, keep the blossoms cut back and take leaf frequently. Harvest a few leaves as needed. Take only tender, young leaves—pull off and discard older ones, as they tend to get bitter as they mature. Try to keep it cut back to perhaps 6 to 8 inches in height. You loaded this page on Friday, 19 April 2019, at 17:09 EDT.